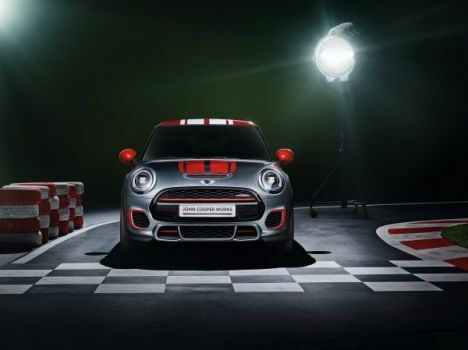 Hallmark MINI style and technology lifted straight from the race track come together to mould the inimitable character of a John Cooper Works model, rendering the MINI sub-brand a byword for irresistible go-kart feeling and genuine everyday usability. And now a new contender for pole position has emerged to take this successful concept to the next stage and bring the promise of maximum driving fun to the small car segment. The MINI John Cooper Works Concept offers a look ahead to the next generation of the elite sports model. The study car will be presented for the first time at the North American International Auto Show (NAIAS) 2014 and flies the flag for innovative sportiness in time-honoured John Cooper Works style, with features including exclusive body paintwork in Bright Highways Grey, familiar MINI red colour accents, bespoke aerodynamic features and 18-inch John Cooper Works light-alloy wheels in a newly developed design.